The Northampton Battlefield Society has won Roy Connell Certificate and Community Star at the NN4eight.co.uk Community awards for their work in coordinating the campaign to protect the site of the 1460 Battle of Northampton from inappropriate development. The awards are given in recognition for outstanding contributions which promote and enhance the character, environment, amenities and overall community conditions for the area of Delapre, Far Cotton and Briar Hill in Northampton. The award to the NBS recognises the Society’s two year campaign to protect the site which has been threatened by the development of a football pitch and associated infrastructure including a car park and flood lighting, contrary to the guidance and protection given to registered battlefields by the National Planning Policy Framework. Working with partners including the Battlefields Trust and English Heritage, the members of the Society worked to coordinate opposition to the development, which was initially promoted and supported by Northampton Borough Council. However, following the outcry the Council Leader, Councillor David Mackintosh, who had personally backed the development plan on the Eagle Drive site, was forced to back track and the Council funded a conservation plan which was adopted by Full Council in July 2014. The Society is not just a pressure group. 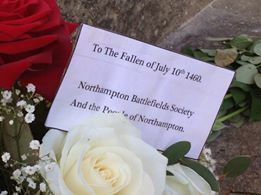 It also works to promote knowledge of the Battle of Northampton, which was the first significant engagement during the War of the Roses, for example by running a series of lectures and guided time walks across the battlefield site close to the historic Delapre Abbey and by promoting a wreath laying ceremony on the anniversary of the battle on 10 July, as well as supporting further historical research into the battle.